Although washing your hands in between patients is an integral part of preventing cross-contamination, it tends to make you more vulnerable to irritating hand conditions like eczema or general dryness. Unlike regular lotions that replace natural oils with artificial ones, Gloves in a Bottle 240ml is an innovative solution that helps you heal from the outside in. The product bonds with your skin cells to create an "invisible shield" that protects your hands against external irritants like regular hand washing. Suitable for use with hand sanitisers, disposable gloves, and surgical scrubs, Gloves in a Bottle feels like it's literally been designed for doctors and nurses alike! 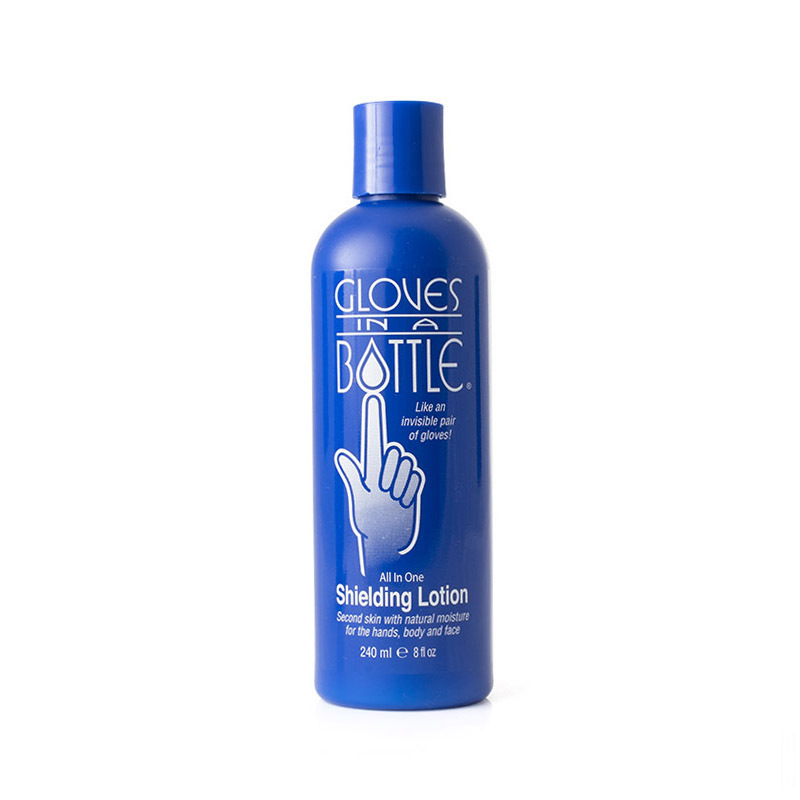 The lotion acts as a protective shield to prevent your hands from becoming irritated by alcohol gels, regular hand washing and protective equipment. This 240ml version of Gloves in a Bottle is excellent for helping you remain protected in a particular place, such as at work where you need hand protection most. If you're looking for a portable version of this bottle for times when you need protection on the go, the Gloves in a Bottle 60ml version is the perfect item for you. Small enough to fit inside most bags, the bottle is ideal for home visits and attending seminars. How Do I Use Gloves in a Bottle? Gloves in a Bottle 240ml creates an "invisible shield" on your skin that helps it retain its natural moisture and oil. This protects the deeper layers of the skin, effectively providing it with the time necessary to heal itself. Wear the lotion with disposable gloves, medical scrubs or alcohol gels without fear of skin dryness or irritation! Unlike traditional moisturisers or lotions, Gloves in a Bottle lasts for up to three hours and comes off naturally when your cells are naturally exfoliated and fall off. This makes a vast difference when compared to other lotions, which tend to vanish after the first application of hand sanitiser or after the first hand wash! This is what makes the lotion truly suited to doctors and nurses in healthcare environments. Not only does this product protect against chemicals and other irritants, but it also improves skin conditions like psoriasis, dermatitis and eczema. Take a look at the difference Gloves in a Bottle has made in just one month below or read the full Case Study here. Please note that it is advised Gloves in a Bottle is not used on open wounds; please wait for your wounds to heal prior to application. Please also note that this bottle may be supplied with a pump action top. The Gloves in a Bottle 240ml is usually dispatched via First Class Royal Mail and delivery should be within 1 to 3 working days.